There's a reason more than 25 million people have come out to see Riverdance over the past two decades. This show brings dance, music, story and song together in a way that leaves the audience with goosebumps, smiles and questions about physics. The show, featuring a troupe of more than 40 dancers and musicians, started in the mid-90s and centers on the rich tradition of Irish dance with a mix of Russian, Spanish and American tap. The production is set up as a seamless series of scenes, each with its own mini-storyline. There's expressions of joy, community, flirtation, fun and friendly competition throughout the show. Mostly though, there's a display of dancing ability that leads the audience to gasp in amazement. One audience member noted that the way the dancers’ legs moved reminded them of marionettes, as if the joints were connecting the thigh and shin in a way that allows the feet to fly in any direction. 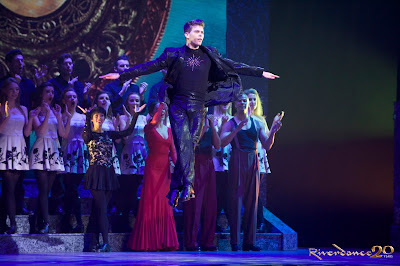 The musicianship demonstrated in Riverdance deserves special recognition. The drums, Irish fiddle, saxophone, low whistle and uilleann pipes combine to create a soundscape that carries the audience from the Irish countryside to the city streets of America and back again. This is a remarkable show that provides quality entertainment for everyone. You don’t want to miss your chance to catch this experience at The Playhouse this week.